The Drop Off pool bar is a relaxing respite located at the Art of Animation Resort’s main pool area. It’s a great place (and really, the only place) to grab something cool and refreshing to take the edge off the many screaming children you may encounter in this popular pool area. 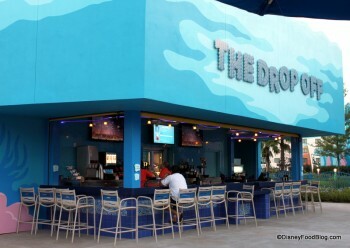 Menu: Full bar, including Disney’s standard cocktail menu; bottled and draft beer; and non-alcoholic drinks. Disney Food Blog Posts Mentioning The Drop Off nothing found.